Welcome to Duarte Figueiredo’s group page! We are interested on the genetic and epigenetic regulation of seed development in flowering plants. We are based at the Laboratory of Genetics of the Institute for Biochemistry and Biology of the University of Potsdam, in Germany. Are you interested in what we do? Then join us! Our group studies the developmental processes that lead to the formation of seeds in flowering plants. 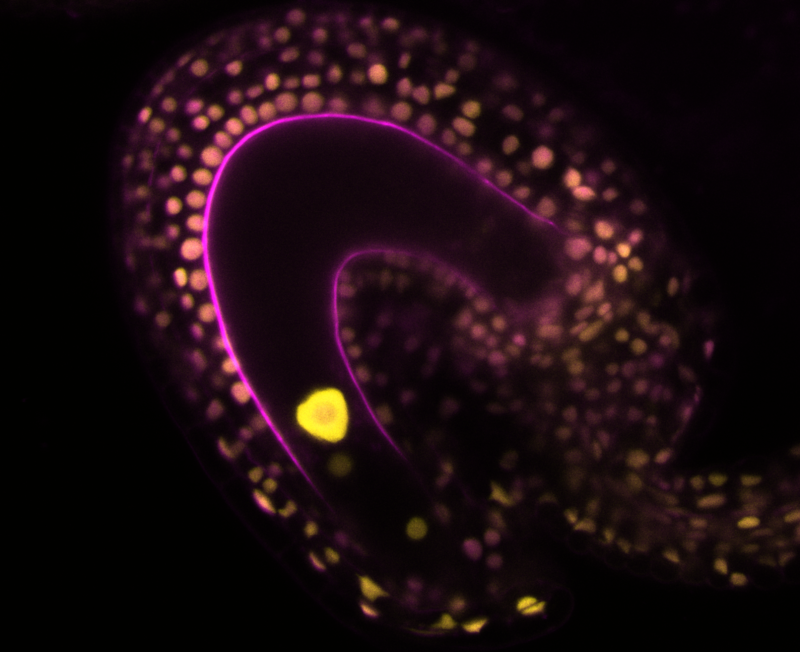 Seed development starts after fertilization of the maternal ovule by the paternal pollen tube. This leads to the formation of two fertilization products: the embryo, which will form a new plant, and the endosperm, a nourishing tissue, similar in function to the mammalian placenta. These two fertilization products are protected by a maternal structure called the seed coat. During the fertilization process each parent provides a copy of its own genome. Therefore, the two parents have to coordinate efforts to ensure that seed development is successful and their genes are passed on to the next generation. The development of a seed is regulated by genetic factors, encoded by the DNA of each parent, but also by epigenetic ones, such as chemical modifications of DNA and its accompanying proteins, the histones. The appearance of seeds marks a major step in the evolution of plants, and many questions remain on the mechanisms necessary for seed formation. Furthermore, seeds comprise most of our food, as well as animal feed. Understanding seed development is therefore of great biological and evolutionary interest, but also has the potential to provide new tools and knowledge for the improvement of our crops.